"After this battle, it will all be over." Titled as Godzilla vs. Mechagodzilla II, this installment to the famed franchise pits Godzilla, once again, against his mechanical double. Unlike its original 1974 movie predecessor, however, this reboot gives us a more serious plot, along with convincing special effects, and an amazing soundtrack experience. When the United Nations hierarchy is begged by the people of Japan to create a cure for their giant monster problem, the scientists at "G-Force" are tasked with creating the ultimate killing machine. 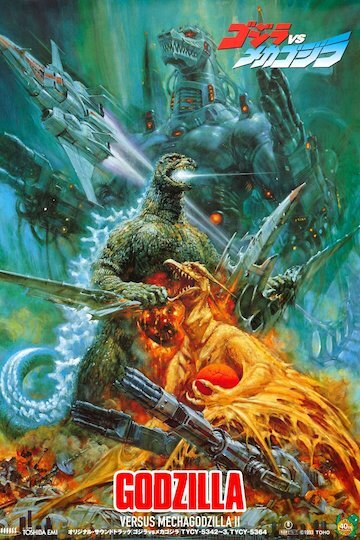 After recovering the remains of the famed Mecha-King Ghidorah, the android's remnants are brought back to their lab and an infinitely-deadlier, more destructive robot is developed. The resulting Mechagodzilla, a robotic clone of everyone's favorite lizard hero, is forged of steel and tasked to do exactly what the tiny island nation of Japan requires - protection through the destruction of Godzilla. During the creation of the new, more powerful and highly-weaponized android, a second scientific expedition team travels to Monster Island and draws the ire and air assault of Rodan, who is protecting a single egg in its nest. As the scientific expedition nears the depths of despair, Godzilla arrives to save them from a certain fate. Taking the opportunity to salvage the expedition, the scientists make off with the egg which, much to their surprise, hatches to reveal baby Godzilla! The proud father returns to Tokyo, after dispatching Rodan, in order to reclaim his son. G-Force sends in the newly-created Mechagodzilla to combat him before Japan can be ravaged once again. The resulting battle is true to the precedent set by every other Godzilla feature film. Though the effects, costumes and miniature sets are far superior to those movies prior to this incarnation, the utterly cheesy acting and dialog remains unchanged. As such, the movie stays true to its movie monster legacy and adds another viable piece to the Godzilla franchise. Godzilla vs. Mechagodzilla II is currently available to watch and stream, buy on demand at Google Play, FandangoNow, iTunes, YouTube VOD online.